Scanning for skin cancer may have just got a lot cheaper. The Skan device - created by students from McMaster University in Canada - scans for melanomas using heat, and looks likely to slash the cost of the procedure. 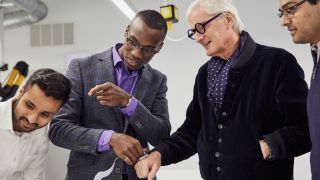 The device was the recipient of the prestigious James Dyson Award that rewards students and recent graduates that are innovating in the world of product design, industrial design, and engineering. It works using a series of thermistors, which are inexpensive and highly accurate temperature sensors, to detect the temperature response of a patch of skin to sudden cooling. The readings are then processed by an algorithm that uses time, temperature, and spacial readings to create a heat map, and show any spots with heat irregularities that could be a melanoma. Melanomas - as cancerous cells - have a higher metabolic rate than normal cells. One effect of this is that they release more heat. By introducing thermal shock by way of an ice pack to an area, and then measuring to see if any areas heat back up significantly quicker, the Skan device can detect the presence of cancerous cells. As with many cancers, early detection is vital to effective treatment, with 5-year survival rates in the US dropping from 98% to 62% when the cancer reaches the Lymph nodes, and down to 18% when the cancer reaches distant organs. Given the high survival rate with early detection, it may come as a surprise that approximately one person dies every hour from melanoma. There are already detection methods using thermal imaging, but they currently use thermal imaging cameras that cost upwards of $26,000 (about £20,000, AU$33,000) and so are only likely to be performed at well funded medical establishments.